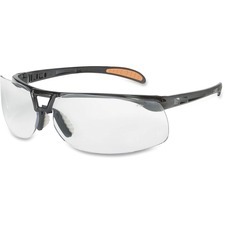 Designed with a proprietary Uvex Floating Lens technology, expandable wraparound brow, soft temple tip pads and nosepiece, this protective eyewear provides exceptional comfort and flexibility. Secure wraparound brow expands to fit a wide range of users. Soft temple tip pads provide a secure fit. Soft, clear nose pads prevent your eyewear from slipping. Eyewear protects against abrasions, airborne particulates and more. Eyewear meets ANSI Z87 standards. PolyLite Shoe Covers are ideal for use in nonhazardous environments such as hospitals, clinics, laboratories, food processing facilities and painting applications. 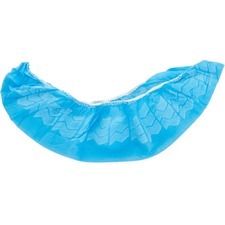 Disposable polypropylene covers are made of cool, comfortable and lightweight polypropylene. Nonskid bottom makes covers safer to use so you can avoid slipping while protecting your shoes. Elastic on the top secures the covers onto your shoes. Extra-large size is 18" long. 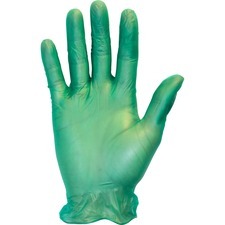 Safety Zone Powdered Green Vinyl Gloves - Medium Size - Vinyl - Green - Powdered, Latex-free, Comfortable, Allergen-free, Silicone-free, DINP-free, DEHP-free, Seamless, Rolled Cuff, Disposable, Ambidextrous - For General Purpose, Cleaning, Food, Janitorial Use, Cosmetics, Painting, Pet Care Vinyl gloves are latex free and our most popular general purpose glove. Vinyl gloves are stronger than polyethylene gloves, and offer greater comfort for jobs like food preparation, bussing and cleaning, where gloves will be worn for longer periods. 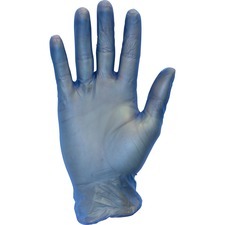 Vinyl gloves are also significantly less expensive than nitrile and latex gloves. 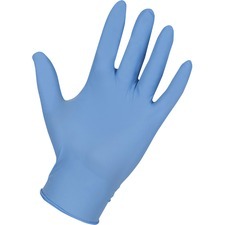 Safety Zone Powdered Blue Vinyl Gloves - Small Size - Vinyl - Blue - Powdered, Latex-free, Comfortable, Allergen-free, Silicone-free, DINP-free, DEHP-free, Seamless, Rolled Cuff, Disposable, Ambidextrous - For General Purpose, Cleaning, Food, Janitorial Use, Cosmetics, Painting, Pet Care Vinyl gloves are latex free and our most popular general purpose glove. Vinyl gloves are stronger than polyethylene gloves, and offer greater comfort for jobs like food preparation, bussing and cleaning, where gloves will be worn for longer periods. Vinyl gloves are also significantly less expensive than nitrile and latex gloves. Industrial nitrile gloves are tough enough to handle difficult jobs. Nitrile material is over three times more puncture-resistant than latex or vinyl. Length is long enough for protection of the wrist. Textured surface provides a secure grip in both wet and dry conditions. Lightly powdered design allows easy donning. 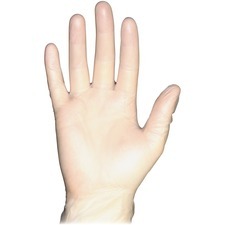 5 mil thick gloves are suitable for a wide variety of single-use applications. Gloves are a size small. Nitrile industrial gloves are tough enough to handle difficult jobs. Nitrile material is over three times more puncture-resistant than latex or vinyl. Length is long enough for protection of the wrist. Textured surface provides a secure grip in both wet and dry conditions. Powder-free, 5 mil thick gloves are suitable for a wide variety of single-use applications. Gloves are a size medium. 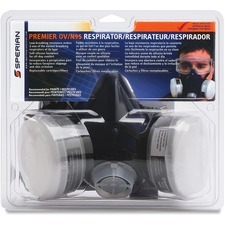 Half-mask respirator is an economical option with many of the same features found in premium masks. A wide, contoured sealing area provides a great fit that's perfect for extended wear. The low "dead air" space limits re-breathing exhaled air to increase comfort and worker productivity. Latex-free straps stretch and move with the worker while providing optimum support. Filters are limited to one 8-hour day of use. 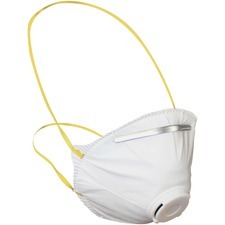 Half-mask respirator is designed for use in agriculture, foodservice, government and municipal service industries. Dust and mist respirator with an exhalation valve helps you avoid breathing nontoxic particles while working. Double-shell construction protects you from the effects of pollen, dust, grass and more. Molded shape provides a tight-fitting seal to prevent particles from getting through. Custom-fit nosepiece sits comfortably on your face and can be used with glasses, goggles or a safety shield. N-95 rated respirator is OSHA and NIOSH approved TC-21C-271.